And it’s gotta be a lot, And you gotta have it now? What do you want? Lip-smackin’ Whip-crackin’ Paddywhakin’ Knickaknackin’ Silabawhackin’ Scalawhakin’ Crackerjackin’ Cracker Jack! Well, not so much anymore. What the heck happened? What happened to the cool prize? The size of the box? The delicious taste? Or was it that we were just kids and ripping open a box of sweet caramel popcorn with a decoder ring inside was just too cool for school? To say Cracker Jack is not the same – well, let’s just say I’m being kind. 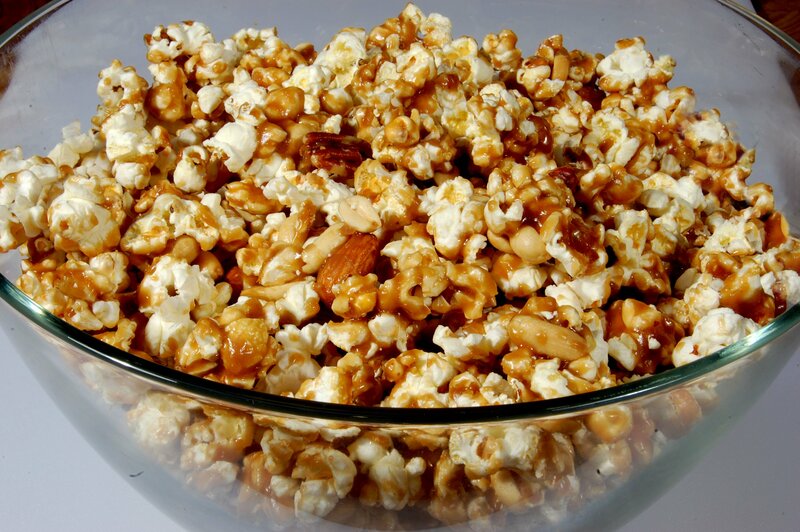 Scottsdale resident Fern Klassen has graciously given up her secret recipe for Homemade Caramel Corn, the same recipe she makes batches and batches of for her holiday gift giving. We got it just in time for Super Bowl Sunday! Her recipe is enough to fill a big bowl, which will undoubtedly disappear before your eyes! As with any candy making recipe, working with sugar can be a bit tricky, and over-cooking sugar can make it gritty and grainy because the sugar crystallizes. What you’re looking for is a glossy coating on your popcorn. Also, if you don’t have a candy thermometer, Fern’s directions for boiling the caramel for 5 minutes is accurate. If you do have a candy thermometer, allow the temperature to reach about 280ºF or the “soft crack” stage. Once you pour the caramel over the popcorn, the mixture will thicken very quickly and it may not cover all of the kernels. In the oven, however, the mixture will thin out again so that you can coat the kernels in several intervals using a spatula or large spoon. Try it! It’s Lip-Smackin’, Silabawhackin’, Scalawhackin’ good! Pop the bags of popcorn and pour into two (approximately 12" x 16") greased baking sheets. Remove the un-popped kernels. Divide the nuts evenly over both sheets. In a medium pot, melt the butter. Stir in brown sugar, corn syrup, and salt. Bring to a boil, stirring constantly. Boil for 5 minutes. Remove from heat and stir in the baking soda and vanilla (the mixture will foam). Pour over the popcorn and nuts. Bake at 250ºF for about 1 hour, stirring every 15 minutes. Remove from the oven if the coating begins to look dull. Cool completely. Break into pieces and store in an airtight container.